Participants in Lian Zhen's workshop October 19-21, 2016 were treated to a 3-day course in creating luminous watercolors. 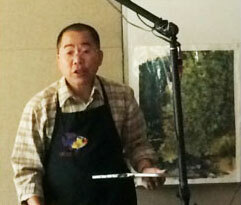 Held for the first time at the Littleton Museum's classroom facility, Mr. Zhen demonstrated mixing pigments on the paper instead of on a palette, and using negative painting to define the shapes of objects in the painting. Marykay Jacobus did a fantastic job bringing a nationally celebrated artist to Littleton! Everyone who bought a book from Mr. Zhen was treated to not only a signed book, but he also painted a picture in it. He gave choices, such as a peacock, a chicken, a sandhill crane, or a flower and others! That was a generous offering! Everyone loved the work space in the Littleton Museum... lots of light and room! Our new AV system was also a hit! Most felt he gave clear instructions and that it was easy to learn his techniques. His teaching pace, his repetition of important ideas and demonstrations were easy to understand. "The best workshop I've attended. I love his work and method of teaching. The venue was perfect." Using just 3 colors was new to many and appreciated. On the night of the 1st workshop, Shirley Lamb generously hosted a pizza party at her home for over 30 artists! It was a chance for members and nonmembers to mingle and to get to know Lian Zhen as a person as well as an instructor.